'Thank you for this afternoon. The children are lovely, polite, so enthusiastic and interesting to be with. They're a real delight and a credit to you and the rest of the staff. As you know, children's behaviour and attitude stems from what they see and hear as well as how they're treated. "Thank you for choosing Llangollen Railway for your school trip. We were delighted to welcome Criftins School and would like to say what a pleasure it was to have your wonderful children here at the railway, the entire team found your pupils so well behaved and interested and the Guard in particular asked that the Headteacher be complimented on their behaviour. We look forward to welcoming you all back soon". "On Wednesday 13th July I had the pleasure of performing for…. nay, with, your years 3 & 4 and 5 & 6. I just want to tell you that they were a credit to their teachers and the school. The children know when to have fun but also when to listen and be serious, it always means that I can put all my efforts into making the show fun and interesting. Your children had learned this important skill and so I had a great time, I hope that came over. At your next assembly will you please tell them how much I enjoyed being with them. I didn’t have time to mention it, but if they do watch the film of War Horse….. tell them to look out for me, I had a whole 4 seconds on screen as an extra! Please will you also thank all the adults that I came into contact with for the warm and friendly welcome, everyone so so kind and helpful it really made my day a pleasurable experience." John Marshall from CREW Productions. During our sponsored walk on Wednesday the children met many people on their journey. 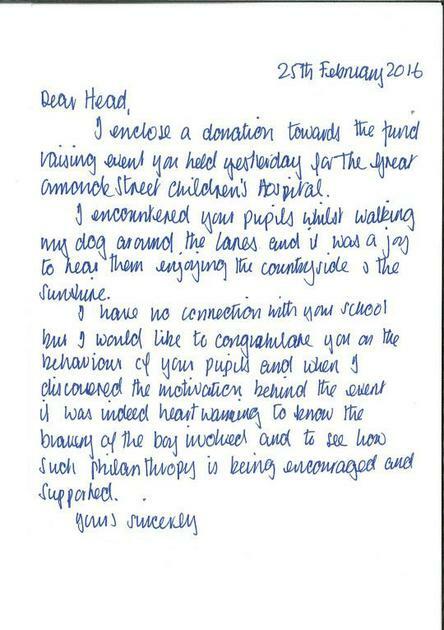 We are delighted to have received this note from a local resident. We are so proud of our Criftins family.